About 15 miles north of Ocean Shores and 80 miles west of Olympia, Washington, is a sleepy, seaside speck on the map called Pacific Beach. It’s the perfect place to escape the grid for a while. There are no stop lights, grocery stores, department stores, or movie theaters and there is not one Starbucks. In fact, until recently, there was spotty cellular coverage and no Wi-Fi whatsoever. You can, however, get teriyaki take-out at the sole gas station in town. Don’t judge; it’s delicious!! Pacific Beach was once an Air Force radar station. In 1987, the facility was disestablished and transformed into a Morale, Welfare, Recreation (MWR) and Education Support Center, Resort and Conference Center. The resulting Pacific Beach Resort and Conference Center is available for use by military, department of defense, and retired military personnel. The houses that once served as officers’ quarters now serve as vacation rentals. They are fully furnished and set up for groups of around 10 people. Our ability to come to this secluded, exclusive getaway is yet another perk of Ray’s work with the government! Our family has been coming to Pacific Beach for more than a decade. Typically, we visit Pacific Beach with a group of friends during the week between Christmas and New Year’s. We rent a four- or five-bedroom house, stock up on groceries for a few days, gather all the games we wish we had more time to play, and settle in to escape everyday life for a bit. No matter what the weather is doing, we always find time to spend some time on the beach. The best part of being in such a small town is that there are relatively few people. (Of course, far fewer people visit the beach in December, but even this trip in April saw few people that we had to share the beach with.) 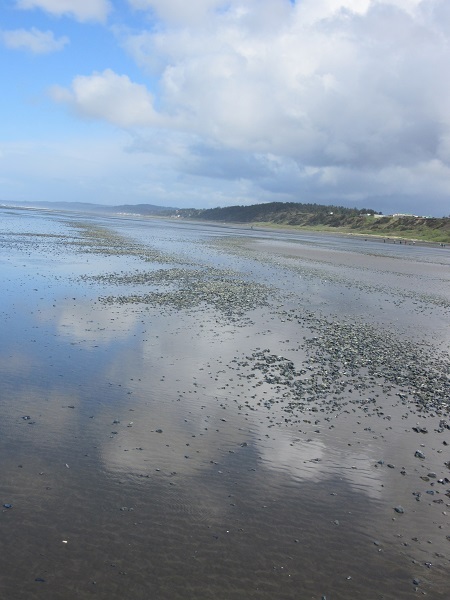 It’s the perfect spot to find beach treasures like sand dollars and sea shells. You can never, ever have too many sand dollars! I’ve even heard that if you are very lucky, you can find a Japanese fishing float washed up on shore. While we didn’t find any floats on this trip (or ever so far, sadly), we did encounter a creature that we had never seen before. Initially, we thought they were parts of soda bottles or some other man-made plastic product. Luckily, I have some smart friends on Facebook and they were able to identify these creatures as velella or by-the-wind sailors. I was mesmerized by these little jellied creatures. They were so beautiful and strange! To break things up, we typically take one day and venture inland a bit to the Lake Quinault Lodge, located on the edge of the Olympic National Park. We hike one of the trails through the rain forest and end up at the gigantic tfireplace in the lodge to warm up with coffee and hot chocolate. On other occasions, we might head to Ocean Shores to catch a movie or eat pizza or grab some groceries. This spring break trip to Pacific Beach was a reminder of how much we love it here. We are so lucky to be able to come here year after year and share such amazing and memorable times with our friends. It was great to get back to this special place before we head off on our big trip knowing we won’t be back here for some time. If you are ever in need of sand, surf, and quiet relaxation, Pacific Beach might just be the place for you. Don’t forget to try the gas station teriyaki… you won’t be disappointed!